1 Start by dissolving the Knorr Chicken and Corn Real Chinese Soup in 1 cup of water. Mix this well until it’s free of lumps then set this aside. 2 Get a medium sized saucepot ready by turning the heat onto medium low. Pour the fresh milk and slow cook for a few minutes before adding the dissolved soup mixture. A good 5 minutes should be fine. 3 Get another saucepan and melt the butter. Throw in the garlic and onions and cook until you can smell the lovely aroma from the cooked vegetables. Drop in the mushrooms and sauté for another minute. Pour in the soup mixture and cook this until the liquid thickens. 4 This sauce is done and ready to be poured over cooked spaghetti noodles. Sprinkle with parmesan cheese or any cheese that you prefer. 5 Go that extra mile by adding a sprinkle of chopped parsley on top to make your dish more appetizing and appealing. 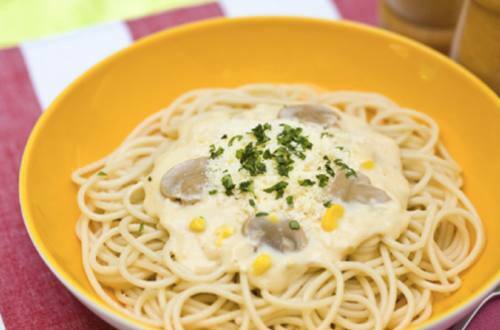 Your spaghetti now not only looks good but also tastes delicious. For sure, your family will give their seal of approval with two thumbs up.